What are considered severe or complex vision issues? You are here: Blog / Scleral Contact Lenses / What are considered severe or complex vision issues? Dr. G. has spent that past couple of decades figuring out ways of restoring “normal” vision to patients with complex vision issues. But what exactly is a complex vision issue? Is it the patient with the high prescription? Possibly. 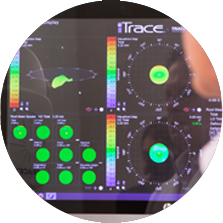 We define a complex vision issue as a refractive problem which cannot be corrected by ordinary optical devices or surgery. In fact, very often the complex vision issue is caused by surgery. In most cases, the issue is caused by a deviation of the shape of the cornea from its original or intended shape, with the result that the cornea no longer functions as a good optical surface. As with any refracting surface, the cornea must be both symmetrical and regular in order to produce a good quality image on the retina. Due to trauma, surgery, or naturally occurring reasons, the cornea may lose its symmetry or become irregular. When this happens, normal eyeglasses and soft contact lenses no longer work as they once did. The problem occurs when the cornea changes shape in such a way that the power of the correcting lens cannot follow it as precisely as it should in order to neutralize those complex changes. The images below contain corneal topographical maps of two corneas. The one on the left has high regular astigmatism measuring more than 4 diopters. The vision is easily corrected with an ordinary spectacle lens. This is because the shape is symmetrical. A rigid contact lens works even better. The image in the center is that of a cornea with moderate keratoconus in which the lower half of the cornea is very steep, and the upper half is flat. The two maps are remarkably similar except that the cornea in the center is very asymmetrical, and the astigmatism would be called irregular. An ordinary spectacle lens would not correct this eye to normal vision. Even a contact lens may not provide totally normal vision. The image on the right is a power map of the eye in the center image. It shows that the power goes from almost – 9.00 D to +6.00 D within the pupil. Contact lenses with wavefront-guided optics, such as LaserFit lenses, can greatly improve the visual results for asymmetrical and irregular corneas.